In a time when Seattle is in deep need of money for its schools, its health care systems, for affordable housing, for public transportation, etc., we are paying $250,000, and rightly so, to protesters who were grotesquely violated at the WTO protests in 1999. And Seattle did not learn from that riot, as it produced two more unnecessary police riots in 2003, which still need to be addressed properly by officials, and perhaps the courts. Perhaps using this WTO case as precedence. According to the Seattle Times, the City of Seattle just settled a lawsuit with protesters for $250,000, over the WTO police riots in 1999. In December 2003, U.S. District Judge Marsha Pechman said the police lacked probable cause to arrest the protesters outside a â€œno protest zone.â€� Pechman said the police had done an â€œatrociousâ€� job at record keeping, as well as citing the use of improper warrant and arrest procedures to round up protesters. Fearing civil lawsuits that were sure to follow that legal determination, the City ran to beat the lawsuit, with a settlement offer they certainly fought earlier. Since ex-Seattle Police Chief Stamper was in charge during the WTO police riots, and he resigned right after those riots in disgrace, that would also make it a bit harder for the City to win over a jury in courts, for several reasons. The City agrees that it would be the Mayor and the Police Chief that are ultimately responsible for the WTO police riots in 1999 if it went to court. And since they would be liable parties, and they are City representatives, that is why the City of Seattle, itself, is footing the bill for this disgrace, rather than the individual officers, for example, who should have all been tried for violent criminal behavior on top of this, in my opinion. It is sickening that protesters who did nothing wrong were criminally bullied, processed and charged, while the violent police never were charged for violent crimes they DID commit. Now, this WTO settlement is some great precedence since the Seattle Police rioted upon peaceful anti-war protesters in Seattle on March 22, 2003, on First Avenue, between Spring and Marion streets, and again on 5th Avenue and Union on June 2, 2003, at the LEIU protests. I witnessed both events firsthand. Many of the issues in these WTO trials will affect the outcomes of these antiwar and LEIU police riot situations from 2003. In weeks after the violence by Seattle police at the anti-war protests in March 2003, the Seattle City Council was flooded with complaints from citizens about the violence on that day, and the ACLU and local organizations reprimanded the Mayor and City government, publicly, for the police brutality we all witnessed. Many of us, myself included, have put in claims against the city for the police and mayoral behaviors at the 2003 protests in Seattle. My contention is that if Seattle police had no right to arrest those protesters at the 1999 WTO protests, for simply protesting, they also had no right to beat, assault, and falsely imprison, from what I saw, (and arrest in some cases), any of the approximately 500 people on March 22, 2003 that police abused in Seattle. The Seattle Police also had no right to riot, from what I saw with my own eyes, using unnecessary force without discretion, as they did at the LEIU protests in Seattle. Attorneys for the WTO protesters argued it was unconstitutional to herd bystanders together and arrest them, without giving them a chance to disperse. Yet that is EXACTLY what Seattle police did on March 22 and June 2, 2003. The WTO police riot abuses took 3 years to go to courts and finally have the city settle. The antiwar and LEIU police riots in 2003 may take a few years to litigate also. But, I hope the system will likewise find the City to be vulnerable in civil proceedings regarding the 2003 police riots also. And the City will continue to pay out in damages and settlements, in my estimation, until it REINS IN THE SEATTLE POLICE AND ITS UNSAFE, VIOLENT BEHAVIORS, WITH SERIOUS CITIZEN ACCOUNTABILITY REVIEWS. The current Seattle Office of Police Accountability is laughable. This concept of acceptable police violence, and â€œno protest zones,â€� has been pushed as far as possible by Bush. I even saw a mainstream TV news story on how no president in American history has needed to be protected from protesters by â€œno protest zonesâ€� like Bush has established each and every place he visits! Another legacy of the WTO police riots is a challenge to this â€œno protest zoneâ€� and its Constitutionality. How do you have free speech WITH â€œno protest zonesâ€� that hide the protesters away from sight?!! That is what Seattle, and American Homeland Security, are trying to argue for. â€œNo protest zonesâ€� undermine the Constitutionally-protected freedoms of speech and assembly so fundamentally that it is amazing this is even up for argument. We will see how it all plays out in the 9th U.S. Circuit Court of Appeals shortly. As that part of the WTO protest case is still to be heard, in an appeal to a 2001 ruling by U.S. District Judge Barbara Rothstein. Rothstein upheld the no-protest zone, saying, according to the Times article, "Free speech must sometimes bend to public safety." But that would mean they had better PROVE there was a public safety issue, and THAT is the crux of it all. Free speech is being â€œbentâ€� PREEMPTIVELY with an EXCUSE of public safety, by the Bush administration and police in Seattle. Just as the Bush administration lies about weapons of mass destruction, it also lies about public safety issues when it comes to political protests. There were no weapons of mass destruction in Iraq, and there were no â€œanarchist threats to safetyâ€� in Seattle on March 22, or June 2, 2003. When Seattle Police were beating, assaulting, and containing us against our will on March 22, THEY were the ONLY public safety issue present. Police were the only ones using violence. I SAW the protesters, they were crossing with the lights! They were using sidewalks and crosswalks until the police stopped us, contained us like animals and had a field day. That had NOTHING to do with public safety. It had to do with REPRESSION OF POLITICAL FREE SPEECH AND ABSOLUTELY NOTHING ELSE. I, personally, was there to PROTEST THE WAR. I was not violent, I was breaking no laws. Yet I was assaulted by both Seattle and Federal riot police. Where was the threat to public safety? IN THE MESSAGE? Because there was no PHYSICAL threat to anything or anyone when police attacked us on March 22, 2003 in Seattle. 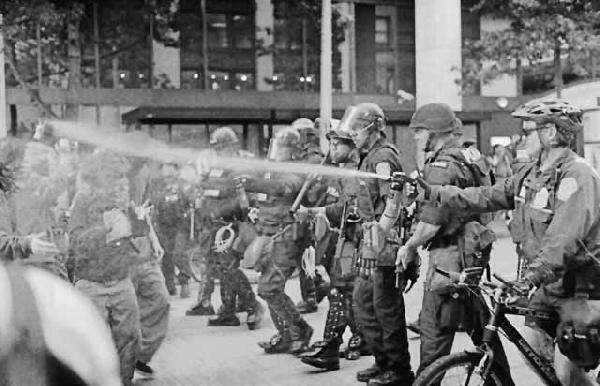 If this concept of extreme police violence upon hundreds of unarmed protesters in Seattle at the WTO 1999 protests, is found to be unconstitutional in the 9th Circuit courts, the City of Seattle will be liable for even more in damages to WTO protesters, still to come. And to LEIU and anti-war protesters after that. The City did not admit any liability in this quarter million dollar settlement, but I think the amount offered in this case speaks for itself. It is not a significant amount for the individual plaintiffs, as after attorney and court fees, they may get between $1000-2000 each. But it IS significant as a fiscal amount missing from the Seattle City Budget, to pay for the mistakes of Seattleâ€™s police. May this begin a new precedent for freedom of assembly and freedom of speech without risk of physical attack by violent unaccountable police in Seattle, and America. â€œAll we say to America is be true to what you say on paper. IS THE RIGHT TO PROTEST FOR RIGHT.â€� â€“ Dr. Rev. MLKing, Jr.